The weather agency only issues a heavy snow alert when there are fears there could be damage to property or disruption to traffic. The last time the alert was issued, in February 2014, Tokyo saw 27 centimetres of snow. 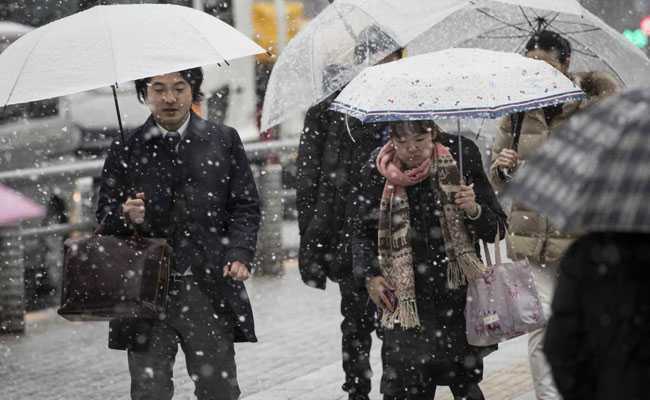 People walk on street during snowfall in Tokyo amid "heavy snow warning"
Tokyo: Japan's weather agency Monday issued a heavy snow warning for Tokyo for the first time in four years, urging people to go home early amid fears of public transport chaos. Japan's northern regions frequently see heavy blankets of snow but such weather is rare in Tokyo. And with the snowfall expected to get heavier, Tsumoru Matsumoto, the agency's chief forecaster, urged people to cut short their working day. "There will be heavy snow this evening" in Tokyo, Matsumoto said, warning that "the snow is likely to affect public transport" when the evening commute begins. Large crowds battled through snow at Shinjuku, the world's busiest train station, as the nightly rush hour began. "In Tokyo, we also warn of heavy snow if the snow is expected to accumulate more than 10 centimetres (4 inches) in 12 hours," Sakiko Nishioka from the weather agency told AFP. The country's northern regions that often see heavy snow have a higher bar for the warning. This prompted some mockery on Japanese social media, with one user noting "public transport is paralysed with such little snow in Tokyo and a flood of people cannot go home. "People in Asahikawa (in Hokkaido) live as if the snow didn't exist."